“Gana was impressed with the head piece that we specifically created for the shoot – we got a Mongolian approval!” said Tussunee. Typically, such a head ornament would be seen on married Mongolian women of high society, with its huge horns of hair inspired by those of cattle, which remain Mongolia’s symbol of freedom. Some also believe the shape of the hair represents a bird-like mythical creature, again symbolising freedom. The overall hair ornament begins with a small silver cap, which is the base of the headpiece. Coral and turquoise stones are often added to this cap for extra decoration. The length of the hair is then split into two halves and braided and plaited- the richer the woman, the more elaborately decorated the lower strands of the hair. The hair is then put into brocade covers (embroidered to personal taste) and shaped into horns using decorative bands. Different tribes have various extra details on their headdresses; one can often tell a woman’s tribe by the style of her headpiece. The one Gana wore during the shoot had a red velvet crown on top called a malagay, which is traditionally worn during special occasions and during travel – Gana seemingly travelled London’s East End during the shoot through the use of collage! This custom-made headdress had beautiful, long ribbons dangling down behind it. Nowadays, such a headdress has become more accustom to special occasions rather than every day use, and often they are created separately as wigs rather than with real hair, due to the extensive amount of time such a hairpiece takes. This particular design was inspired by history books and ancient paintings. The designer behind this larger than life headpiece is Danielle Eagles and it took her several solid days of work. All of the materials were carefully selected and sourced from local places, such as fabrics from Shepherd’s Bush Market and beautiful beads from Soho and Kennington. 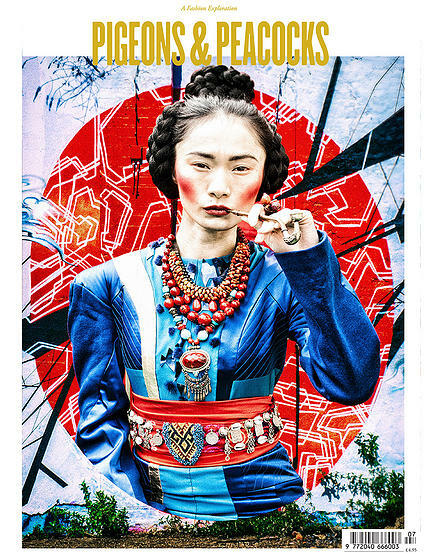 Again, the editorial merges traditional Mongolia with typical London areas even behind the scenes. The headdress was made purely from scratch, in order to create a convincing costume piece. Danielle also created the red dress used in the shoot which was delicately handmade with love and care, using pure silk, intricate detailing and Mongolian inspired patterns. It seems there was no boundary in design for this shoot and no detail too small. Mongolian fashion has been heavily influenced by China, Russia and various other countries. When looking at Mongolia on a map it is easy to see why, being surrounded by such influential neighbours. Examples of this can be seen within the shoot, such the red dress styled under the lamb fur coat which is inspired by Kazakhstan fashion. Also notice the purple satin robe, which is normally seen in Chinese costume. These traditional robes are called deels and can be worn both everyday and during special occasions and worn by both the men and women of Mongolia. Colour is far more popular in the females and purple in particular is a popular choice. Note how the dress fastens up at the front – this is traditionally used as a pocket in order to carry things. Sashes and belts are also another technique of carrying things. Mongolian fashion is designed with one thing in mind; the freezing cold weather all year round. Therefore, much of its fashion choices are more necessity than personal preference. This includes stiff, upturned tipped Winter boots, as such boots need to be thick in order to walk through inches of snow – a flat toe would be impossible to manoeuvre in. The styling of the shoot was very ‘battle of the elements’. Gana can be seen cradling a baby goat in the editorial but of course working with animals never runs smoothly. The shoot would not have been as successful without the help of animal lover Laura from Stepney City Farm (another East End location). Every time she tried to collect the chicken for its close-up it would run away, clucking and squawking loudly. It took a few attempts but finally she managed to pose it on Gana’s traditionally broad and padded out shoulder and they eventually got the shot. Mongolian fashion typically features a lot of large, dramatic shoulders in order to create a unique and powerful shape with an element of costume and theatre. Another reason for the dramatic shoulder shapes is protection from the cold weather. It also mimics the style of past Emperors, as royalty has been yet another influence of Mongolian fashion over the centuries. Many natural materials were featured within the shoot, such as a real leather belt coloured in a bold red and lots of stone and mineral accessories in an array of dominant colours. Lots of beads and big belts were another style choice for the traditional Mongolian photo-shoot. Accompanying the intense selection of chroma were various animal hair and fur pieces. Fur is extremely popular in Mongolian fashion, originating from the animal skins used as a method of survival during the cold weather. Mongolians have always used natural resources of the land to keep warm, hence the leather used. Goats fill a large part of the animal population in Mongolia thus becoming a natural resource. Nowadays Mongolian goat’s hair is popularly used for making cashmere and of course goat fur coats. The inspiration behind the such a daring colour pallet within the editorial is simple; red and blue remain Mongolia’s national flag colours and blue represents the eternal sky of Mongolia with the red symbolising Mongolia’s ability to fight through the harsh weather. The yellow soyombo is an adaptation of the symbols meaning fire, water, Earth, the sun and the moon. The use of pipes within the shoot comes from the model’s nostalgia, where her memories of Mongolia as a child always include adults holding smoking-pipes; perhaps it was the distant smell of tobacco that she was recalling whilst posing. 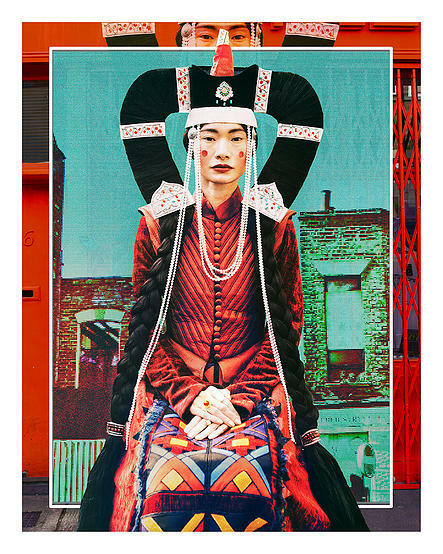 Although the editorial is devoted to authenticity, there is another element to the shoot (note the collage effect) which brings us a fusion of traditional Mongolian fashion juxtaposed with East London life. This may seem a bizarre blend, but it makes the editorial incredibly personal. 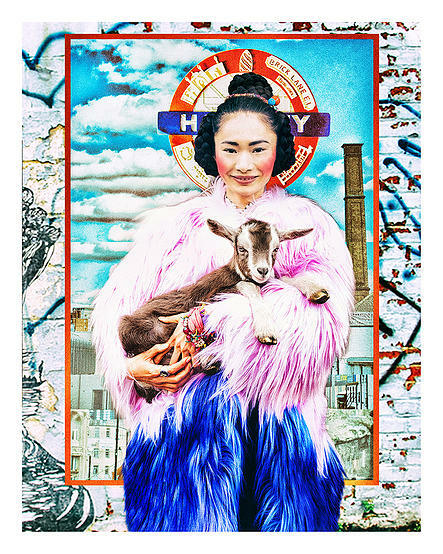 Tussunee talks us through her careful editing, where she marries the picturesque Mongolia with the gritty East End.